Trump Has Abandoned Democracy Promotion. Which Countries Could Fill the Void? 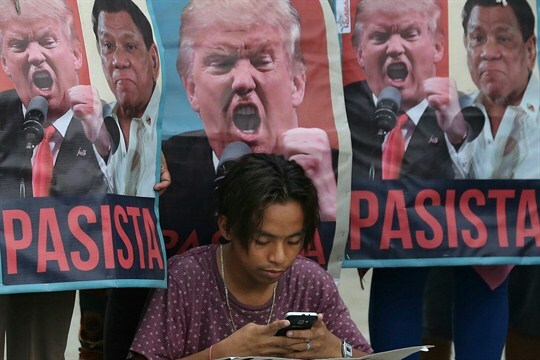 A demonstrator checks his smart phone in front of pictures of U.S. President Donald Trump and Philippine President Rodrigo Duterte, Manila, Philippines, Nov. 14, 2017 (AP photo by Aaron Favila). More than a year into the Trump administration, it is obvious that the White House has little interest in using the bully pulpit or U.S. economic clout to promote democracy and human rights around the world. With a few exceptions, such as Venezuela, Iran, Cambodia and Cuba, the administration rarely speaks about human rights abuses in other countries. As president, Donald Trump has held meetings with autocratic leaders whom the Obama administration refused to invite to the White House, like Thai junta leader Prayuth Chan-ocha and Egyptian President Abdel-Fattah el-Sisi. Trump has also praised some foreign leaders’ abuses of the rule of law, most notoriously Philippine President Rodrigo Duterte’s vigilante war on drugs.